How To Use A Tempo Trainer- INTRO | Mediterra - Swim & Run Better Than Ever! Stroke Length (SL) – the distance your body travels forward in each stroke cycle (of each arm). For instance, Coach Mat is 1.76 meters tall and has a comfortable SL of 1.2 meters. For more discussion on this click Stroke Length and Wingspan. Stroke Per Length (SPL) – the number of strokes taken on 1 length of the pool. Obviously, this number is dependent on the pool length, as well as how long your push-off from the wall is. And it depends on how you count your strokes. For more discussion on this click Stroke Counting. Stroke Rate (SR) – the number of strokes you take in a minute (or second). This is the inverse of Tempo or 1/Tempo. Tempo – the number of seconds per stroke. This is the inverse of Stroke Rate or 1/SR. After reading this you may want to view Finding Your Tempo Range. Here are a couple ways that a Tempo Trainer (TT) can be put to practical use in your TI training. Slowing down the TT tempo past your normal range helps expose Balance and Streamline struggles in your stroke, and give you an opportunity to make corrections and train your neurological system. Balance and Streamline are the foundation for Easy Speed. Speeding up the TT tempo faster than your normal range helps develop your ability to hold a long SL while increasing SR. A long SL with a high SR is the key to generating Efficient Speed. It is easy and misleading to assume that simply increasing Stroke Rate (SR) will make the swimmer faster. But unless long Stroke Length (SL) is carefully protected while increasing SR, most of the increased effort will be wasted in shoving the water around rather than driving the swimmer forward. By training with care and discipline, a TT will help you develop into a much faster swimmer because you will become more skillful in each stroke and require less power. I want to share an example of using the TT for both purposes. But before we go there it would be most helpful for you to gather some data about your current swimming metrics. First, determine the Strokes Per Length (SPL) you most naturally use during the distance event you are training for. If you need an idea of how to do that, see our SPL article on the Resources page to see a suggestion for how to measure this. Next, determine the Tempo you most naturally use for that same distance event. If you need an idea of how to do that, click HERE. Actually, what this method shows is how to calculate your ‘tempo’ setting (seconds per stroke) which is what we set the Tempo Trainer by. In physics SR is velocity which is strokes per second = 1/tempo. Tempo, is the inverse, and corresponds to Pace (how many seconds per 100 meters, for instance). You may see these terms, SR and Tempo, used interchangeably, but don’t confuse them if you are actually going to work out some math calculations. We can easily count strokes and we can track Pace by the clock, so Tempo is what is most practical to use in our calculations. Once you know these two metrics – your current SPL and Tempo range – for your own stroke, you will have a realistic reference point for comparing the results you get when using the Tempo Trainer. 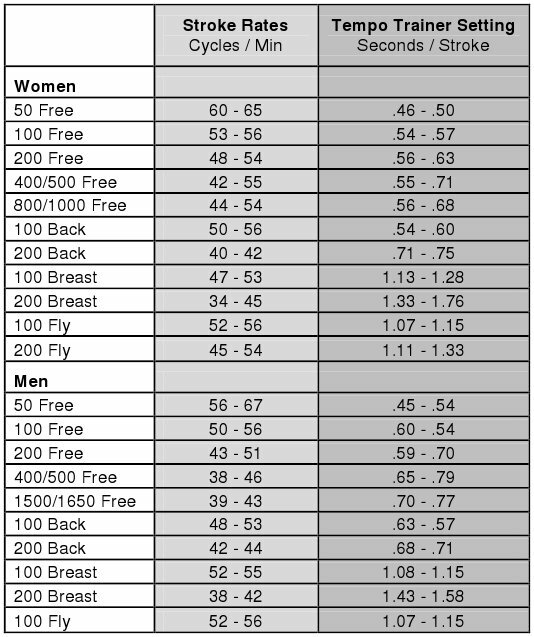 So the most basic way we calculate the Pace we want to swim is by determining a certain combination of SPL and Tempo. In order to improve speed in an intelligent way you must keep measurements of your SPL and Tempo. There is a common saying in various forms, “Only what is measured will be improved.” In Advanced TI Training we count strokes and keep tabs on tempo constantly. A TT is there to help you measure and increase your intuitive sensitivity to Tempo, so that you can adjust your Tempo intentionally when you are swimming without one. SPL and Tempo are the objective variables in Pace- they are like using the gears on a bike, or in a sports car. It is very important to put your body into the appropriate gear for your body, and for the swimming goal, strategy and conditions you are facing. The more you are aware of these variables at any point in your swim and have trained to adjust them at will, the more command you will have over your swim experience and results, under all kinds of conditions. Next lesson: Using A Tempo Trainer: SLOW IT DOWN! © 2011 – 2015, Mediterra International, LLC. All rights reserved. Unauthorized use and/or duplication of this material without express and written permission from this site’s author and/or owner is strictly prohibited. Excerpts and links may be used, provided that full and clear credit is given to Mediterra International, LLC and Mediterraswim.com with appropriate and specific direction to the original content. I used your TT sessions adapted for my son and they look to be giving very good results. We are trying to work on the 200m free. Do you think we should start doing some sets GOING DOWN TO TT settings of 0.7 …to get to race rate even if the SPL suffers before that. Certainly he can start working on faster tempos. He needs to know what he is aiming for, so that if he has to give up SPL he knows how much he can afford to give up and still reach his goal. First, we need to know three things. Have your son swim a 200m near his best effort (or if you have a video of a recent performance). 1) Count strokes per length for each length of the swim. 2) Take the splits for each length. 3) Estimate the stroke rate (tempo) for each length. Your son has an ability to swim the 200m in a certain way right now. By analyzing how he is achieving this 200m right now, we are in position to figure out what he needs to work on. Then set a goal for what time he wants to swim the 200m, say, in 2 or 3 months from now. Using that time goal, we can calculate what SL x SR combination(s) he needs to be capable of in order to make that goal. Once he knows that he won’t simply be working on faster and faster tempos, but faster tempos while preserving a target SPL. It will be much more difficult training (for the neuro-muscular system) but much more successful. If he gives up too much SPL while increasing Tempo he’ll never reach his goal. We need to know the data for where he is at, and calculate the data for where he wants to be, then as he works his way down, he can make intelligent decisions about how to progress, how to trade SL for SR, and where his weaknesses are that need to be developed. Rather than just swimming harder with faster tempos, cranking out mindless laps, he will make much. much faster progress this way by using his time in the water to target specific skills that will best determine whether he reaches his goal or not. If you would like, I can calculate some suggested SL x SR combos if you can supply me with his current time and SL x SR on 200m, and what his goal time is. Main question : what would be an ideal SPL or SL? It depends on his wingspan (or height will approximate), age (developmental stage), and skill for lowering drag. If his current SL is less than 50% of wingspan then I would recommend working on improving SL (through improving balance and streamline, not by being more powerful). See my recent essay Smart Speed Part 1 for some guidance on estimating SL. good you are extremely resourceful Matt….his span is 1.72m ( 1.59m tall) so that is quite close to what your SL is!…we will aim for 15 strokes per 20m then….his last time was 2mins 38s but I think his timing was not right. He should be aiming at around 2mins 20s, in my opinion…with patience as you say, it can be achieved. Thanks lots.